Connections: Mâcon 50 (other connections available). 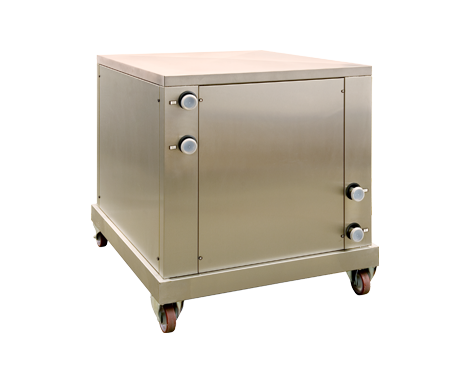 The mobile compact heat-exchanger HE 60 is comprised of a coaxial heat-exchanger, operating in cross-current. It is made all in stainless steel, and set on a mobile stainless steel chassis with wheels. The HE 60 was specifically developed for application in the wine and beverages industry. The tubes are made of food-safe stainless steel and are specially suited for fluids containing particles. Due to the spiral structure of the tubes, pressure loss is minimal. The HE 60 can be used with a wide range of mediums and liquids including a light cleansing liquid. The HE 60 is easily operable and mobile due to its wheels, allowing extra flexibility in its application. The HE 60 is therefore the ideal solution for vintners that are looking for a compact and cost-attractive solution for cooling and heating liquids through all stages of production.